MOST MESSED-UP MOMENT: The movie starts with a closeup of a big puddle of white bubbling goo. Along comes a scary hillbilly, whose first response to seeing a big puddle of white bubbling goo in the ground… is to eat it. “This stuff is GOOD!” he says, and with that, a new dessert fad sweeps the nation! SUMMARY: Mo Rutherford (Michael Moriarty, aka “Law and Order”‘s Ben Stone) is chosen by some guys on a boat to investigate The Stuff. “They call me Mo,” says Mo, “because whatever it is I want, I always want Mo!” Mo travels around nearly aimlessly, talking to people about the Stuff. They seem to like it, but as it turns out, the Stuff is a disgusting fungus-like creature that eats people from the inside out. 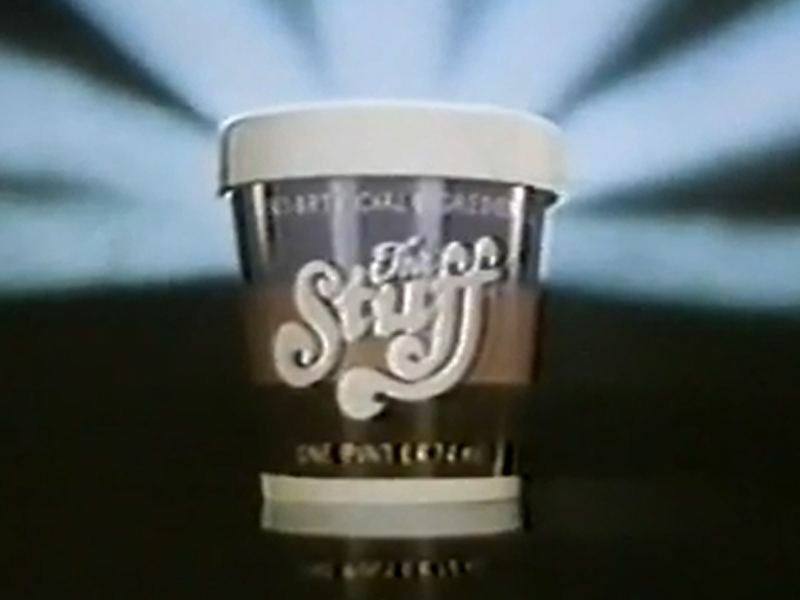 He meets up with a kid whose family has essentially gone nuts from eating too much Stuff, and meets up with Charlie (Garrett Morris of “Saturday Night Live” fame), who used to work for the Stuff’s corporation (we think), and set out trying to stop the Stuff from infecting more people. To do this, they meet up with a paramilitary nut (Paul Sorvino, also a former “Law and Order” star, in a hilarious cast-against-type performance) who leads his militia against the Stuff… sort of.